Following a brief post in September, Sheila Burt reports in more detail on “Forced From Home,” a Doctors Without Borders exhibition that aims to educate visitors on the record number of displaced populations around the world. As we crowd into an inflatable boat designed to mimic the ones used by refugees attempting to cross the Mediterranean, Anna Haskovec, an Australian logistician for the humanitarian group Doctors with Borders, describes life adrift at sea for migrants seeking safety. Inflatable boat designed to mimic the ones used by refugees attempting to cross the Mediterranean. Haskovec, who has worked in the north of Uganda and Papua New Guinea, has also supported several search-and-rescue vessels in the Mediterranean. These missions were severely hindered recently after the Panama Maritime Authority revoked registration of the Doctors Without Borders search and rescue ship Aquarius in September. Anna Haskovec, an Australian logistician for Doctors with Borders who has worked in the north of Uganda and Papua New Guinea, and on several search-and-rescue vessels in the Mediterranean. During rescue efforts, Haskovec said, aid workers often smell the passengers to assess who was close to the motor, strip them down, and apply ointment to try and heal their wounds. On a recent voyage she assisted with, one man was lying so still at the bottom of the boat that she thought he was dead. The boat is part of “Forced From Home,” an interactive exhibition that asks people to put themselves in the place of the estimated 68.5 million forcibly displaced people worldwide. The exhibit recently finished a weeklong stint in Chicago and is a reminder of the fragile relationship between armed conflict, natural disasters, and public health. It is also a poignant attempt to personalize the stories of people who have no choice but to flee their home in the face of war, famine, or persecution. According to the United Nations High Commissioner for Refugees (UNHCR), the number of displaced persons has reached the highest since WWII, with the largest number of people coming from war-torn Syria, Afghanistan, and South Sudan. International law established under the 1951 Refugee Convention recognizes the right to seek asylum, though automatic and permanent protection is left to the decision of individual nations. In recent years, border closings and increasingly restrictive government policies toward refugees continue to add to the crisis. As the number of displaced persons grows, some humanitarian groups and social scientists are considering ways in which storytelling and perspective-taking exercises may shape public perception and educate the public on the refugee crisis. Representatives from Doctors Without Borders, which is also known by its French name Médecins Sans Frontières or MSF, say they hope “Forced from Home” encourages people to gain a deeper understanding of why people may be forced to flee their homes, and the perilous journey they endure, through a tactile, personal experience. The project began in 2016 on the east coast and has since traveled every year around different regions of the country. For each hour-long tour, MSF guides describe their firsthand experience working with refugees as visitors stop at tents that portray life inside medical stations and camps. For one stop, visitors have 30 seconds to choose five items to take with them — items they are asked to give up along the route. Virtual reality and 360-degree videos add to the interactive experience. Medical issues and health needs of migrants are also brought to light. While journeying to safety, people fleeing countries where the healthcare system has been destroyed may face chronic health conditions like diabetes and heart disease that have been left untreated, as well as malnutrition or frostbite. In areas without strong healthcare, proper sanitation, or access to clean water, highly contagious diseases like malaria or cholera may also spread. MSF works to curb outbreaks by administering vaccines and medications if available, treating patients, and providing health education on disease prevention. Educational drawings on the prevention of malaria. Standing next to a medical station, Elvis Otieno, a project coordinator who has worked with MSF since 2004 in South Sudan and other countries, described a woman in Kenya who struggled to speak and clearly required medical care but told doctors she couldn’t stay. Elvis Otieno, a project coordinator who has worked with MSF since 2004 in South Sudan and other countries. Conditions often vary for families as they travel and when they reach a camp. Some fleeing their country may journey to established camps or get stuck at borders. 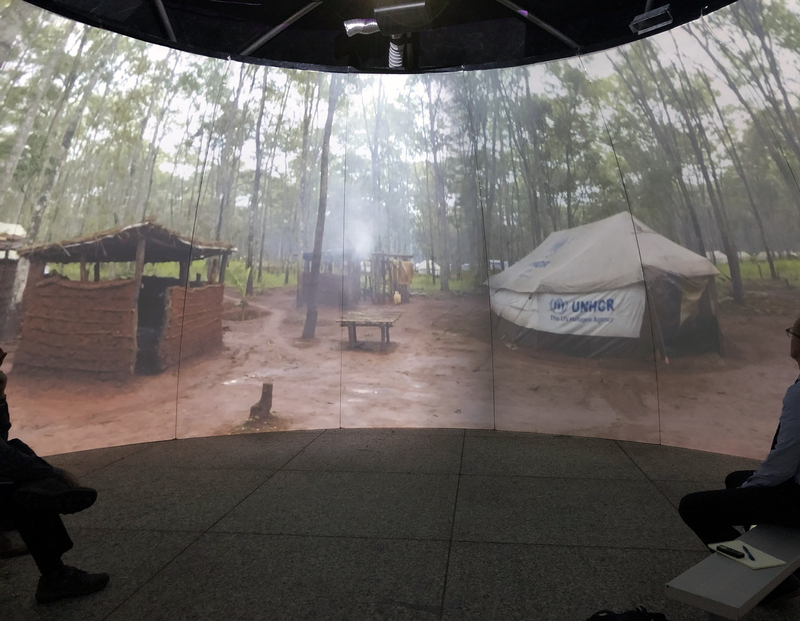 Toward the end of the exhibit, we stepped inside three different tents that represented settlements or informal camps for displaced populations in Somalia, Bosnia, and Iraq. Otieno asked us to consider the conditions that people must withstand for an unknown time period, such as continuous sand or dirt blowing in food as they cook or sub-zero temperatures. Tent representing a settlement in Bihać, Bosnia. The last tent, representing a camp in Domiz, Iraq, was a bit larger, with futons, cooking ware, and toys strewn around. Otieno asked us how many people might live here. After a few guesses, he said that the tent isn’t for one family but likely two, separated only by a small divider. Part two of this story will feature interviews with two MSF nurses as they describe their fieldwork. “Forced From Home” finished its fall 2018 tour on November 11 in San Antonio, Texas.